with several aspects of daily life particularly education and agriculture (nutrition). Keeping this complexity in mind our NGO tries to deal with all of these three aspects. Life expectancy of Nepalese people has significantly increased in the recent years however the morbidity rate is still high, mainly due to communicable diseases. Most of these diseases prevail because of lack of access to proper sanitation and the common practice of open defecation. Effective interventions through a variety of community-based or national campaign approaches are necessary to reduce such diseases. HEAD-Nepal aims to implement nationwide communication programs encouraging people to engage themselves in healthy behavior. Similarly higher rates of stillbirth exists in hilly and mountainous ecological zones, though Nepal has made considerable progress in improvement of maternal and child health. It is surprising to notice that women who reported open defecation were at greater risk of stillbirth compared to those who had access to improved sanitation. This lack of proper education and sanitation compounded by poor economic conditions in those remote rural areas are the major factors for stillbirth. Hence, we believe that, a community-based intervention is necessary to increase awareness and provide basic health care access to women from these rural areas. This approach will have a massive and far-reaching impact on maternal and child health.In terms of maternal health, we intend to bring awareness regarding common preventable illnesses as well as diseases that can be detected earlier and hence managed effectively. 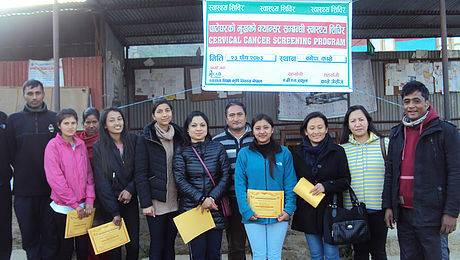 One such disease is cervical cancer and it is the most common cause of cancer related death in Nepalese women. This is mainly because of the lack of proper screening and early detection of this disease at the government level. Hence, our initiative in this area is to conduct programs which can help in presenting data to program managers at the Ministry of Health to make future strategies in curbing cancer and other non-communicable diseases. Nepal’s economy is based on agriculture and its rich biodiversity. Without modernizing our traditional agriculture, we can’t provide proper nutrition to our growing population. To improve the health and well being of our people, we are not only concerned with health and sanitation but also interested in national economy and sustainable development through the application of modern technology i.e. biotechnology. Considering the fact that our rich biodiversity is yet to be explored, Health-matters, with its team of biomedical scientists is also interested in exploring such potential and in co-ordination with the government officials so as to aid in uplifting national economy. health, education and economy of the country’s growing population. services integrating it with education and nutrition. Our mission is to build individual and institutional capacity to create effective health and population development policies and programs. We pursue to assist policymakers in the Ministry of Health & Education and National Planning Commission in formulating strategies and implementing it for the improvement of health, education and economy of the country’s growing population. Conduct free camps services in regard local relevant health issues. Publication of bi-annual journal of medicine (Nepalese Medical Journal). Distribution of newsletters among targeted population. Regular discussions and interactions among the members. Conduction of free classes regarding health education and nutrition in the targeted population.